Dreamsea Surf Camp France is situated in Moliets Plage on the south west of France. If you come to Dreamsea France it is because you carry a young soul and wild spirit inside. Here you will find the mood for surf, adventure, party, and energy every week. There are no strangers here, just friends you havent meet yet; and they are always surfing, skating, dancing, playing music and having fun! Are you a wild soul but you like to read a book, sleep in a hammock or just enjoy the sound of the birds? You can choose to stay in the new glamping area with fully furnished tents and placed in the peaceful camp outskirts. Sweet dreams come from a well sleeping. In Dreamsea, good rest plays an important part for having a great surf camp experience. The participants are provided with comfortable tents with quality mattresses. You won't have to sleep on an air bed. There is a perfect place for everyone, that is why there are two kinds of accommodation distributed in two different areas. Dreamseas glamping tents are located in the quietest zone of the camp, perfect if you want more privacy and isolation and decide when to join the party and the surf camp life. On the other side, are the normal tents, based around the heart of the surf camp, your place if you are looking for fun, party, people and good mood. Glamping is a new and growing trend from the last decade, a fusion of glamour and camping. It is a perfect concept for those who love the positive points of camping and outdoor lifestyles but want to forget all those negatives aspects and enjoy complete comfort. Choose when to relax or join the vibrating life of the camp. If you are traveling with a group of friends or alone and you are looking for an amazing time, getting to know new people from all over the world, party and fun, this area is the place to be for you. These tents are right in the epicenter of all the surf camp movement, you won’t miss a thing. Always respecting the others, after a certain hour we have to continue partying in the clubs downtown. Choosing this option doesn’t mean losing comfort. We offer big tents on wooden floors with proper mattresses. They are shared by two or three people depending on the size of the tent. Be part of the surf camp life and don't miss a thing. Beds and all bedding included. No need to bring a sleeping bag or duvet. With Dreamsea Surf Camp France, you can be assured of safety and comfort in the water, this is down to the fact that we provide one instructor per eight students. The instructors will be in the water helping you out, so you will be able to take advantage of the personal attention the instructors will give you. Your instructor will also be the same all week long, meaning you will be able to forge a relationship that will help get the best out of your lessons! Each surf lesson lasts 90 minutes, and you will receive a minimum of 10 hours per week, 15 hours with the intensive course, normally 2 lessons per day, this makes Dreamsea Surf Camp the best option if you are really interested in learning how to surf. Of course in the surf camp in Moliets, France Dreamsea has the best equipment, which you can use even after the surfing lessons, all for free. When you want to have some break from the sea, Dreamsea Surf Camp France also offers the following great activities to make your surf camp much more fun, exciting and memorable. After a few days in the camp it’s time to see who has improved the most playing beach volley. Join the volley tournament and win fantastic prizes, good fun guaranteed! Now it is the turn of the Ping-Pong tournament! Show your skills with the table tennis bat in tough duels in the “arena” (sand). After dinner a great movie will be shown in the chill out tent. Join and have a relaxed evening kicking back with their special movie selection. Be creative and make some crazy costumes to fit-in the awesome themed parties. Learn how to move and loosen your hips during their mojito party. Show your singing skills or break some eardrums in their karaoke nights. 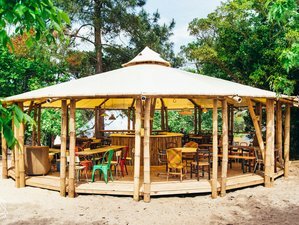 Dreamsea Surf Camp France is located in one of the best camping spots in Moliets Les Cigales, only a five minute by walk from the beach. Also in the vicinity is the protected forest in the Landes area, you are also only a few minutes walk from the wonderful Moliets Lake, a magic place perfect for relaxing and admiring the natures awe-inspiring beauty. The weekly menu is built around a balanced diet taking into account the effort you realize every day. During the breakfast you will enjoy a great buffet with variety of fresh fruit, daily made bread, milk, juice, etc. During the dinner you will enjoy international dishes, always followed by the Spanish cooking touch. Vegetarian options are offered too. There are several airports to arrive at. They are Biarritz Airport (BIQ), Bordeaux Airport (BOD), Bilbao Airport (BIO), San Sebastian Airport (EOS). The nearest is Biarritz airport. Transfers from and to the airport is available on request. Airport: Bordeaux–Mérignac Airport Airport transfer available: Bordeaux–Mérignac Airport (US$56 per person) Additional charges may apply. You can request this in the next step. Airport: Biarritz Pays Basque Airport Airport transfer available: Biarritz Pays Basque Airport (US$39 per person) Additional charges may apply. You can request this in the next step. Dreamsea Surf Resort offers the best holidays and surfing package in order to make the most of your holidays.